Ending a year should always be with a BANG! but starting a new one should be more than that. Your business and personal finances may have been good or bad this year, but nevertheless, you can always make it better for the next year. Here’s an idea that could be worth getting into the list of your new year’s resolutions – opening a checking account with Chase Bank. Up until January 15, 2012 Chase offers a special promotion that gives you an extra $150 just by opening a personal checking account with them except for Chase College, High School and Access Checking. Just by simply going to their website, you’ll just have to enter the link for their promotion and complete the process in three easy steps. First, enter your e-mail address in order to get your $150 bonus coupon. Second, open a qualifying checking account and set up a direct deposit of at least $100 within sixty days from the opening of your account. And third, upon receiving your direct deposit, Chase will automatically deposit your $150 bonus to your new account within ten business days. The layout of the promotion is to provide clients with a better option regarding checking accounts that are safe, reliable and with an added benefit of a bonus, but the finer details should also be taken into consideration. Basically, the promotion is just for those who are about to open a new checking account on or before the date of expiration of the promo. However, if you already have a checking account with Chase, you may still avail of the promo by opening a new personal checking account. The initial direct deposit must also be done electronically from your employer or from the government, or from your pay check, pension or other government benefits. In other words, the opening deposit cannot be the bonus money from this promotion, nor any money held by Chase from your other accounts. Be that as it may, opening a new personal checking account will surely aid you in controlling your financial affairs. With a reliable bank such as Chase, the services are guaranteed to be top notch. Plus with a simplified checking procedure, you can always keep on track in all of your checking and banking transactions. 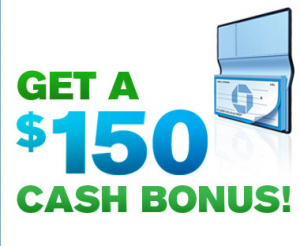 It is a great way to open up the New Year, not just with a bang but with a big $150 boom!